A few years ago, Battle Fantasia was released internationally for the Xbox 360. Japan got the game on both the Xbox 360 and the PlayStation 3. Arc System Works, along with Dot Emu, have created the Revised Edition exclusively for Steam. The goal was to tweak the balance of the fighters and fix some problems that plagued the original release. Does the Revised Edition improve the overall game or is it relatively the same? Battle Fantasia: Revised Edition takes place in an unknown fantasy world. The story is cliché at best. Ages ago, four heroes drove away a threatening darkness plaguing the world. Now the darkness, known as the “Scion of III Prestige,” is slowly returning, and it is up to a group of fighters to find it and either destroy or unleash it. Of course, the story is rarely the main focus of a fighting game. It just gives players a reason for our roster to fight each other. Having a fight in the middle of town is perfectly normal. Battle Fantasia features 12 playable characters from which to choose. By today’s standards, it is a small cast of characters for a fighting game. In the overall scope of the game, 12 characters is a good size of characters to complement all the playable modes in the game. The roster includes Freed, Urs, Marco, Olivia, Ashley, Cedric, Watson, Coyori, Face, Donvalve, Deathbrinder, and Odile & Dokurod. The roster takes inspiration from both classic fairy tales and fantasy stories. 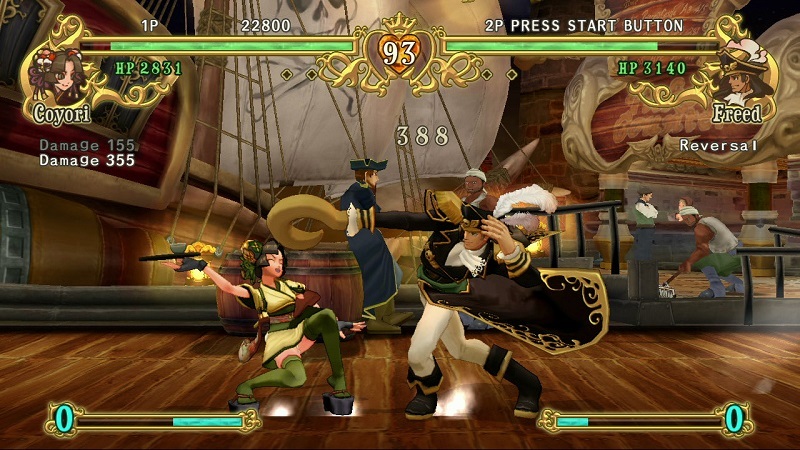 Unlike other fighting games, the characters have a health meter with different HP allotments. This adds light RPG elements to the game. On paper, it looks like the characters with higher health would have the advantage. Fortunately, that is not true. Character balancing takes several components into accounts. The tank characters such as Donvalve and Deathbrinder have more health, but are easier to hit and have slower speeds, while light characters such as Watson and Marco have less health, but are faster and can pull off combos more efficiently than their heavy counterparts. It would have been nice for all the characters to have the same amount of health for consistency, but I am glad Arc System Works balanced the characters through their stats. I found Captain Hook’s long-lost cousin. The game’s visuals are a mixed bag. The 2D backgrounds are colorful and vibrant with beautiful areas and scenery. Each area has its own specific theme and the colors match the stage. The forest is full of greenery, the desert looks empty and brown, and the underworld is fueled by raging fires. The characters are 3D sprites, but their appearances are all over the place. Some characters look fine and others are disproportionately shaped to the point it looks unpolished, blocky, and polygonal. The soundtrack is not memorable, but the themes match both the atmosphere and the mood, with the whole soundtrack recorded with an orchestra. The stages full of fauna and flora have natural melodic tunes, the dark and rough places have darker and stronger bass tones, and the towns have quaint, quiet music. Mastering combos is the key to victory. How does the game play? 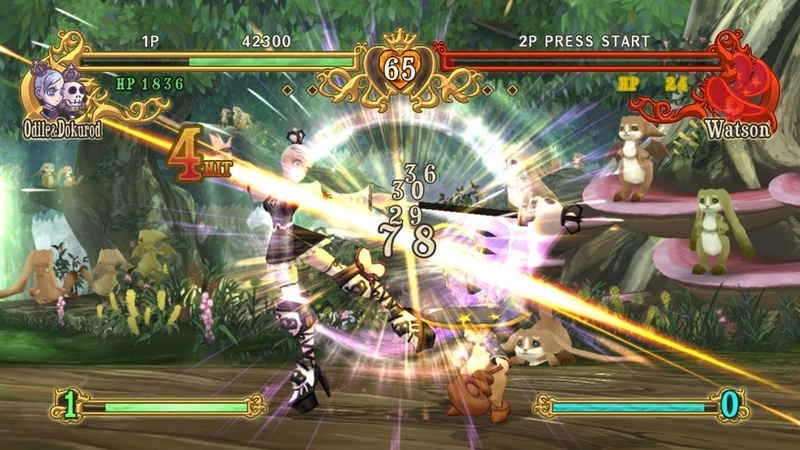 Battle Fantasia: Revised Edition has two characters fight against each other in a 2D stage until one of them wins the match. Players have a light punch, heavy punch, light kick, heavy kick, and a throw move. The key to victory is to master various combos and block attacks efficiently. As players take and deal damage, a “magic” meter fills at the bottom. This meter can be raised all the way up to Level 3. Characters can use this meter to activate “Heat Up Mode.” Heating up allows characters to pull off more powerful combos and deal more damage. At the maximum level, characters can heat up three times. One mechanic players will have to adjust to and master is the jumps. Jumps are floaty and will feel awkward both in execution and in landing. Players can use either a keyboard or a controller to control the game, but this, for some odd reason, has to be set up in the settings before launching the game. Maybe they didn’t have time to include a controls option within the game? There are multiple modes included in Battle Fantasia: Revised Edition. Arcade Mode is your standard arcade style playthrough against your opponents from stage to stage. There is a Survival Mode and Time Attack Mode for those who want a good challenge, as well as a single player Story Mode. By playing through each character’s story mode, there are unlockable images and costumes to acquire. To get 100% completion for characters, certain criteria have to be met for different paths to open up, and it’s not easy to figure out. From what I could gather, it is based on winning and losing to specific characters. An alternate path is opened when you run into an unexpected character. As with every fighting game, Battle Fantasia: Revised Edition supports local and online multiplayer. Unfortunately, I was unable to experience the online multiplayer for this review. I made many different attempts over the course of several days to find an online multiplayer match. To my luck, I was unable to find a single match. Either there isn’t a ton of online traffic or there is a technical issue going on. I could not figure out which situation, but I would likely say there isn’t a ton of online traffic. Review is based on the single player portion of the game, this review is based on seven hours of gameplay. Review copy supplied by publisher.